Carrying excess weight has been linked to a variety of chronic ailments, including heart disease, strokes, and diabetes. Being overweight in middle age has also been linked to an increased risk for Alzheimer’s disease late in life. But, a new study suggests, overweight seniors do not appear to be at high risk for memory problems. In fact, seniors who were underweight were more likely to be at risk for Alzheimer’s disease, the study found. The six-year study, reported in the medical journal Neurology, examined 3,885 seniors living in Chicago. Nearly a fourth of the men and women were overweight or obese. All were given memory tests at the start of the study, with regular follow-ups over the next six years. The researchers, from Rush University Medical Center, found that overweight or obese seniors were not at higher risk for developing memory problems. One recent study, for example, found that women who have dementia start losing weight at least 10 years before the disease is diagnosed. [See the article, “Weight Loss May Occur Years Before Alzheimer’s Onset in Women.”] One reason may be that loss of initiative, along with a loss of sense of smell, in the very early stages of memory loss would discourage seniors from eating nutritious and regular meals. Still, nobody is suggesting that seniors pack on pounds to help stave off Alzheimer’s disease. Carrying excess weight during the middle and seniors years is associated with a list of physical ills, like heart disease, arthritis, and diabetes. And while this particular study did not find a direct link between excess weight and memory problems, more research is needed to clarify the association between obesity and Alzheimer’s. The best bet is likely to try to maintain a normal weight and good nutrition through a heart-healthy diet rich in fruits, vegetables, and whole grains. 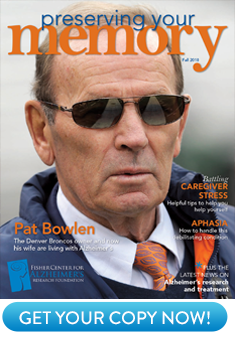 For more on the care and prevention of Alzheimer’s disease, visit www.ALZinfo.org. M.T. Sturman, MD, MPH, C.F. Mendes de Leon, PhD, J. Lienias, Scd, et al: “Body Mass Index and Cognitive Decline in a Biracial Community Population.” Neurology, September 19, 2007.